The Central Georgia Council is one of the largest councils in Georgia geographically, serving 24 counties of middle Georgia. Over 5,600 youth are served each year in programs from first grade through high school. About 1,800 adult volunteers serve Scouting under the guidance of a volunteer board of directors and a relatively small professional staff of seven. Assisting the volunteers and professionals is an administrative support staff of four and a full-time ranger. 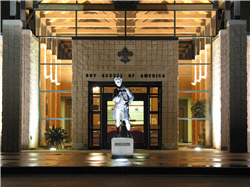 Established in 1919 as the Macon Council and officially chartered by the BSA in 1921, the Central Georgia Council (renamed such in 1923) has served many thousands of prominent alumni including former Senator and Eagle Scout Sam Nunn, the late Brig. Gen. Robert L. Scott, Jr., U.S.A.F. Retired, WWII Ace Pilot and author of “God Is My Co-Pilot” and the late Astronaut and Eagle Scout Manley L. “Sonny” Carter, Jr. Also, Herschel Walker was a Cub Scout in the Central Georgia Council. The council is divided into three geographical districts - Ocmulgee, Oconee, and Robert L. Scott. The council also places a council-wide emphasis on successfully marketing Scouting to selected populations through the Scoutreach, Exploring, and Hispanic Emphasis programs.